The MODIS instrument aboard NASA's Terra satellite captured this true-color image of Hurricane Ivan on September 5, 2004 at 13:30 UTC (9:30 AM EDT). 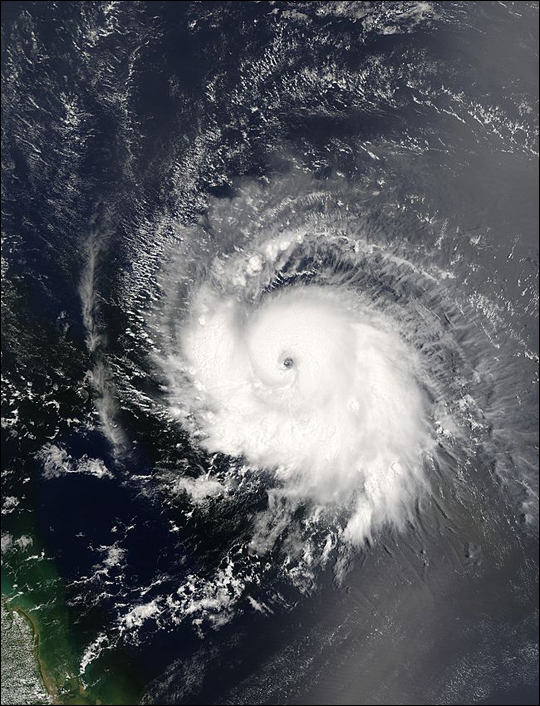 At the time this image was taken Ivan was located approximately 1670 km (1040 miles) east of the Windward Islands and was moving towards the west near 33 km/hr (21 mph). Ivan had maximum sustained winds near 140 km/hr (85 mph) with higher gusts. The MODIS Rapid Response System provides this image at additional resolutions and formats. NASA image courtesy Jacques Descloitres, MODIS Land Rapid Response Team at NASA GSFC. When Hurricane Ivan blasted through Pensacola, Florida, it cut apart a bridge on the heavily traveled Interstate 10. The gap in the bridge is visible in this ASTER image, acquired on September 21, 2004.